Dungeon Scouts - What's New? Dungeon Scouts has moved from sunny Southern California to (the somewhat less warm) Montreal, Canada. I'll be talking to Girl Guides of Canada - Quebec to see how the Dungeon Scouts program can be implemented here. For the time being, be aware that we're pretty much out of Dungeon Scout patches/crests. Once I have more information on how I'll be moving the program forward in Montreal, I'll be shopping around for a vendor to make new patches in Canada. It could be a while, so please be patient. ​If you're a Girl Guide or a Girl Guide leader in the Montreal area, feel free to contact me and introduce yourself. 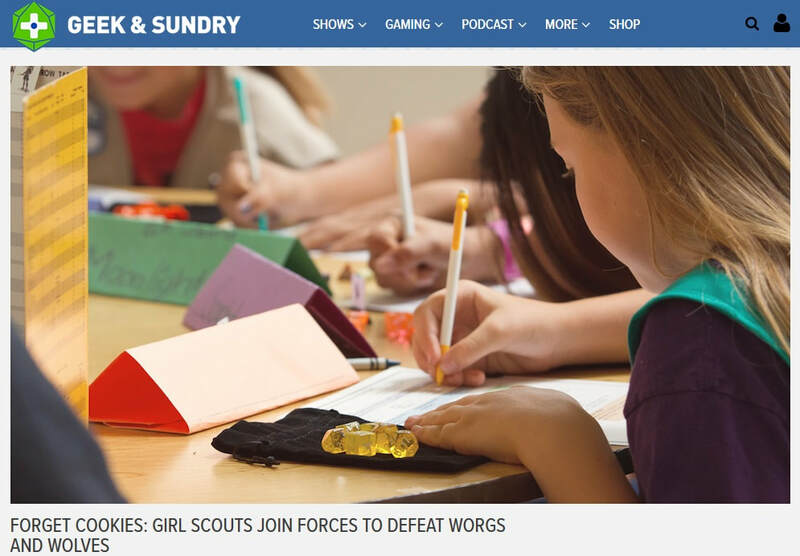 It's not exactly new news, but Dungeon Scouts was featured on Geek & Sundry a while back. You can read the article here! Here's the video version of my interview on the Adventure Party podcast. Enjoy! There's a wonderful blog post from December of last year up on The Writer's Disease listing the top ten reasons that tabletop RPGs are better than video games. While Dungeon Scouts isn't about replacing video games with tabletop role-playing - after all, I work in the video game industry and fully enjoy playing video games on console and PC - I would love to see more kids of all genders exercising their imaginations in an unplugged social medium. Please give this awesome article a read and see what you think! Today, I'm driving down to Chula Vista, California, to run a TRPG workshop for a Cadette troop. It's very exciting! Remember, if you're local to North San Diego County, I'm more than happy to schedule a TRPG workshop for your troop. Drop me a line through the contact form on the Dungeon Scouts website and we'll get the ball rolling.